With our qualified staff, AL-FLA Plastics can perform a broad range of on-sight service work such as HDPE liner repairs, tank repairs, as well as fiberglass repairs. 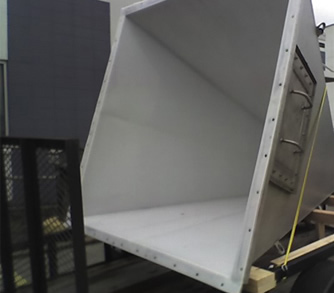 With our extrusion and hot-air welders we are equipped to handle jobs of any size. AL-FLA Plastics serves a broad range of customers from large, multi-national industrial concerns, to small commercial businesses, to individuals. While we are large enough to be effective, we are small enough to operate on individual, close terms with our customers. As a customer driven company, AL-FLA Plastics provides responsive, personalized service and possesses a genuine concern for our customers’ needs. We realize that our success hinges on our ability to take care of these needs in a friendly, efficient, and cost-effective manner and we are continually working on ways to better serve you.